As expected, Huami has announced today a new iteration of its flagship sportswatch. The company has called it Amazfit Verge and not Amazfit X as had been rumored. Coming in at a very competitive $115, it sports a very accurate heart rate sensor, NFC support and built-in GPS. 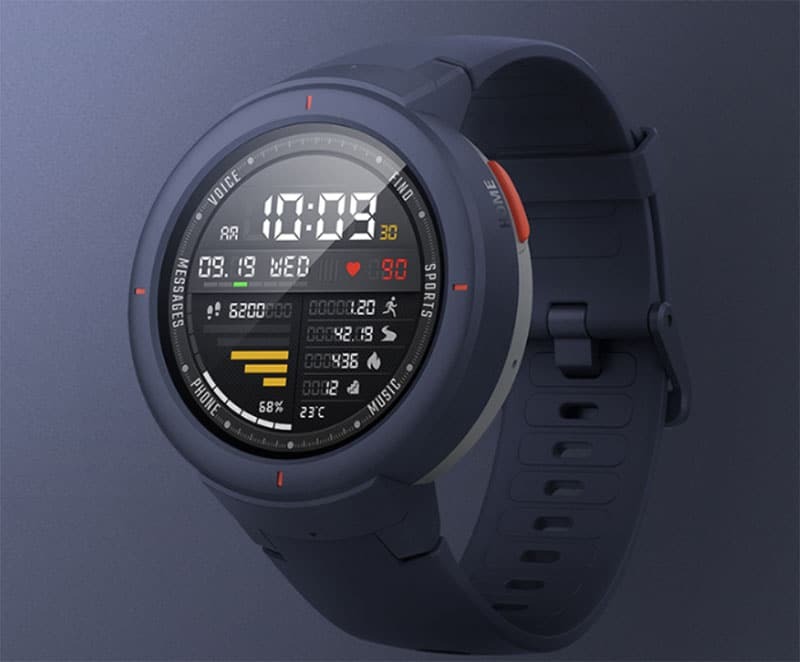 The upcoming device is a new version of the Amazfit Stratos GPS sportswatch. In our review, we found Stratos is a solid offering and are sure it has lured some customers away from the likes of Garmin and Polar. The timepiece offers most of the features you’ll find on more expensive devices, but at a fraction of the price. There is clearly a lot to like and with Verge the company is introducing some new functionality whilst keeping the price super-low. The new device looks to target the sporty types rather than fashionistas. In a sense it comes across as a blend between the Amazfit BIP and Stratos. It has a silicone strap, reinforced plastic casing and a bright red physical button on the right. Coming in at only 46 grams the watch is very lightweight. The diameter of the case is 43 mm and the AMOLED screen measures 1.3 inches (360 x 360 pixel resolution). This is protected with Gorilla Glass 3 and the whole thing is IP68 certified, so you can’t swim with it. Under the hood is a 1.2 Gh dual-core processor, 512 MB of RAM and 4 GB of internal storage. The device is equipped with a GPS and GLONASS module, WiFI and Bluetooth 4.0. In additional to the usual sensors Amazfit Verge has a geomagnetic sensor and an air pressure sensor. There are 11 different sports modes to choose from including: running (outdoors and indoors), trail running, walking, mountaineering, tennis, skiing, football, cycling (outdoors and indoors) and elliptical. All this is powered by a proprietary operating system so don’t look for Wear OS, its not there. The most novel feature is the improved the heart rate sensor. Apparently, the watch is able to keeps tabs on your ticker with an accuracy of 98% and 80% lower power consumption (compared to Amazfit Stratos). Similar to Apple Series 4 watch, the more accurate heart rate measurements will be used to identify cardiac arrhythmia and atrial fibrillation. This is a group of conditions in which the heartbeat is irregular, too fast, or too slow. The hope is such a feature will help people who are not aware they suffer from the condition. There are notifications, other smart features and an NFC chip for contactless payments. Seeing as its launching in China first it will support AliPay and UnionPay which will be launched in November. Users will also be able to pay for transportation in 165 Chinese cities. Huami has collaborated with US agency Territory Studio on 13 types o clock preset dials. If don’t like any of them you can add your own custom dials. The watch also has a built in microphone to facilitate the voice assistant – Xiao AI and the MIJIA application. Battery life is a decent 5 days on a single charge which is impressive considering the specs. Expect this to come right down, though, with GPS switched on. Amazfit Verge will arrive today in two Chinese stores (JD.com and Tmall) and will retail at 799 yuan or about 115 US dollars. No doubt this will increase when it makes it across the border.